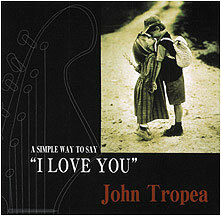 A Simple Way To Say "I Love You"
Produced by John Tropea and Will Lee, for San Tropea Music & Sinning Saint Productions Inc.
Logic Audio & ProTools Digital Engineering & Editing by Tommy Mitchell and Jon Sebastian Tropea Jr. Mastered by Gene Paul, DB Plus Studios, N.Y.C. Basic track engineered by John Tropea and Jon S.Tropea Jr., Sebastian Studios, Cliffside Pk, N.J.
Mixed by Gary Chester, National Recording, N.Y.C. Basic track engineered by Gary Chester, Recorded at National Studios, N.Y.C. Additional engineering and mixed by John Tropea and Jon S.Tropea Jr.
Sebastian Studios, Cliffside Pk, N.J.
Additional engineering and mixed by John Tropea and Jon S.Tropea Jr., Sebastian Studios, Cliffside Pk, N.J. Engineered and mixed by John Tropea, Sebastian Studios, Cliffside Pk, N.J.
Additional engineered by Phil Ludwig and Jon S.Tropea Jr.
Mixed by John Tropea, Sebastian Studios, Cliffside Pk, N.J.
Additional engineering by Phil Ludwig, Matt Knobel and John Tropea, and Jon S.Tropea Jr.
Mixed by Bob Brockman and John Tropea, Sebastian Studios, Cliffside Pk, N.J.